Providing you the best range of viscous slurry transfer pump, slurry pump, slurry transfer pump, bentonite clay slurry pump, coal slurry pump and lime slurry dosing pumps with effective & timely delivery. NETZSCH Viscous Slurry Transfer Pump offered is backed by reliable technology support and provide for high performance as per the specific process needs of the customers. Finding suitability for pumping of foam concrete, these industrial high viscous slurry transfer pumps come with advantages like no sealing element and leakage free operations. 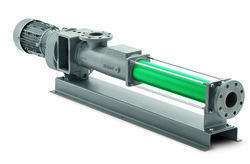 The NEMO® Slurry Pump is used for demanding applications in every industrial market worldwide. Bearing housing design with free input shaft pump can be run with any type of drive, such as servo motors, diesel motors or hydraulic drives. This pump can also handle high-pressure applications. Four rotor/stator geometries are available, to customize the pump for your application. The NEMO® SY is suitable for all industrial markets where low- to mid-viscosity and/or shear-sensitive, abrasive or adhesive substances must be safely and gently handled. We are successfully engaged in offering a commendable array of Slurry Transfer Pump. The offered pump is precisely manufactured using superior quality raw materials and advanced machinery in adherence to the set industrial standards. The product offered by us is highly appreciated by our clients for its smooth finish and high durability. Clients can avail the offered pump from us in various customized options at competitive prices. NETZSCH Oil Water Slurry Pumps are versatile stand-alone equipment used primarily in the Environmental, Chemical, Food and Pharmaceutical industry. These pumps handle almost any kind of substance continuously and gently, while metering in proportion to rotation speed.